While Angelino Heights is perhaps better known for its storybook Victorians, it also has quite a few Craftsman, including this restored one on Ridge Way. We often suffer from house envy looking through listings, but this one is also inspiring abject, craven shoe envy. If only we had a closet to accommodate that many shoes. So...many...shoes...Sorry, distracted for a minute there. The four-bedroom, two bath main house also has a separate guest house with one bedroom, one bath. The house also features a "huge lush yard and landscape. An absolutely idyllic setting with mature trees, shady nooks and plenty of sunlight. 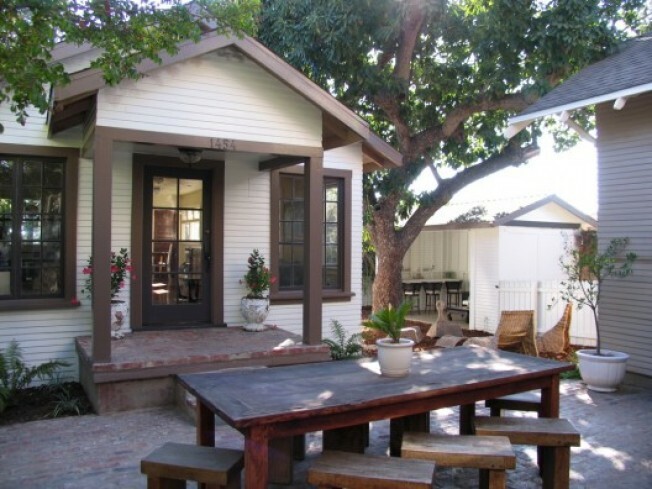 Vintage one car garage has been converted into a charming summer cabana and opens to the yard and studio." Asking price: $1.279 million.